Getting a military hair cut. A military hair cut is a required part of the uniform and grooming guidelines of all branches of the armed services, but contrary to popular belief, there are actually many styles that conform to the requirements of a military cut. Because of that versatility, many civilians also opt for military styles. The military requires certain hair styles and cuts just as it requires certain clothing and other personal grooming habits: to present a dependable, conservative, functional image that demonstrates the clean-cut and reliable nature of the military. While many people assume that the mandatory hair cuts are meant to break in new recruits to an uncompromising lifestyle, there are actually many practical reasons for a military cut: the no-nonsense style aids in personal identification (there is no hair to obscure the face), will not become tangled in equipment, can be styled quickly and easily, and requires little day-to-day maintenance. In fact, the ease of caring for a military style is what prompts many civilians to adopt similar short styles that fall within military guidelines. There are many types of hair styles that fall within acceptable military standards. Prospective recruits should note that there are minor differences between each branch of the service, and guidelines are generally far harsher for new recruits during the first few weeks of training. When in doubt, opt for a more conservative style or consult an active duty or former serviceman for tips. Hair must be a natural color; dyes may be used but must be a traditional hair color. Style must be tapered to conform to the head without touching the ears. Sideburns must be neatly trimmed and may not extend past the upper part of the ear lobe. Cornrows, dreadlocks or other braided styles are not permitted. Parts may be cut into the style but must be in a natural location. Toupees or hairpieces are only acceptable for medical reasons or to conceal baldness if desired. Headgear must be able to be worn properly with the hair style. 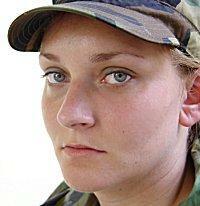 Hair must be short enough or pinned up so it does not touch the collar of the uniform. Hair accessories are only permitted when necessary to keep hair pulled back and they must be as close to the natural hair color as possible. Bangs may not extend over the eyebrows. Excessive grooming aids and styling products are not permitted. Ponytails or pigtails must be fastened to the head; free-swinging styles are not permitted. There is actually quite a bit of leeway within those style guidelines. Flattop buzz styles are popular options, as are short all-over buzz styles. Many men's styles are suitable as military hair cuts, and women often opt for short styles or find quick, efficient ways to pin up long hair. Under no circumstances, however, are trendy or fad styles such as emo or punk styles permitted. Because military styles are easy to care for and efficient, they are frequently adopted by individuals who lead an active lifestyle and don't care to spend excessive time styling their hair. For men in particular, many businesses and professions offer similar hair style guidelines: police officers, for example, are required to sport styles reminiscent of those approved by the military. Before choosing a military-type cut, however, it is important to understand that to keep such a short style looking its best, frequent trims may be necessary and consulting with a professional stylist will determine any additional individual concerns. Any barber can produce an acceptable military hair cut, but salons and barbers near large military bases are more likely to be familiar with precise regulations for that branch of the service. The styles are frequently cut with just clippers and only take a few minutes to create, unless the initial hair is quite long. Individuals reporting for basic training or enlisting as cadets in military academies are often given a fresh hair cut within days of reporting to duty (typically on the first day), and recruits should bear that in mind when planning a new style just prior to shipping out. Individuals interested in a military-style cut without enlisting can ask for military cuts at most major salons and will find themselves with an acceptable style. 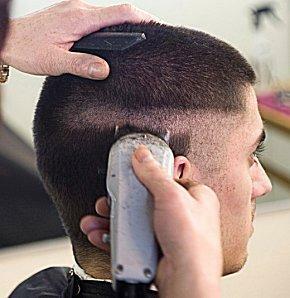 Fast to cut and fast to style, military hair cuts are becoming more popular in the civilian population. Though the guidelines and regulations may initially seem severe, there is much leeway for personalization without forsaking the uniform image the military seeks to present.